The Tacx Mini Tyre levers T4885 have an innovative- and lightweight design making it the perfect on-the-road tyre levers that I put in my Scicon Elan 210 Carbonium saddle bag. The Pedros Tire Levers are the preferred tire levers for your garage. No matter if you need to change tires on a mountain bike, road bike or trekking bike, those Pedros Tyre Levers simply don’t break. Out on the road the Tacx Mini Tyre levers T4885 rule. The Tacx Mini Tyre Levers with model number T4885 weigh 19 grams and have the following dimensions 100 x 20 x 11 mm. (L x W x T). The Tacx Mini Tyre Levers have almost the same length than the Continental Race Tyre Levers, but the width between these Continental Race tire levers and the standard Tip Top tire levers. In my opinion the Tacx Mini Tyre Levers are wide enough and the rounded edges make it perfect to hold. The most innovative design feature of the Tacx Mini Tyre Levers is the ability that the two levers slide into each other. First this design saves space in your saddle bag. Second you can’t puncture your spare inner-tube, because the wedge/point of the lever is well protected inside of the spoke hook of the other tire lever. Out on the road I have never used these spoke hooks. The pictures above also show that the downside of the lever point is reinforced with plastic ribs to protect the Tacx Mini Tyre Levers from breaking. The Tacx Mini Tyre levers T4885 are my preferred tire levers for out-on-the-road use. I’ve ordered the Tacx Mini Tyre Levers T4885 from the Bike Components online store for the price point of € 1,99. This price point is even cheap compared to some other solutions available. In my garage however I will still keep using the Pedros Tire Levers. 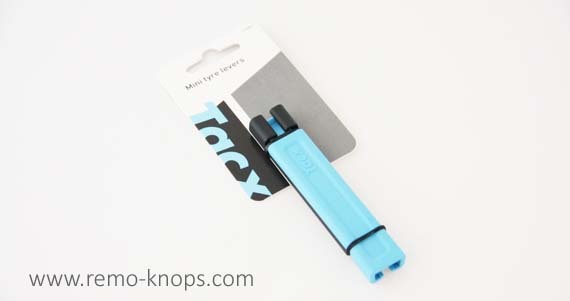 Hey!, I found this information for you: "Tacx Mini Tyre Levers T4885". Here is the website link: https://www.remo-knops.com/5101/tacx-mini-tyre-levers-t4885/. Thank you.